According to the World Health Organization (WHO), about 800,000 people commit suicide worldwide each year. In 2012, suicide was the leading cause of death in the age group between 15 and 29 years. Belgium scores poorly in comparison with neighbouring countries, with 14.2 suicides per 100,000 inhabitants, compared to 12.3 in France, 9.2 in Germany and 8.2 in the Netherlands. 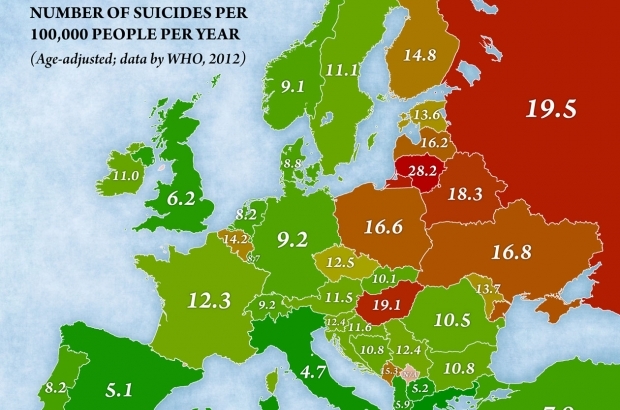 Eastern European countries show the highest suicide rates, as highlighted by this map of Europe, especially Lithuania with a disturbingly high 28.2 suicides per 100,000 inhabitants. The WHO data is age-adjusted, which means that the figures shown are not the real suicide rates but rather theoretical suicide rates if every country had the same age composition, since the likelihood of committing suicide tends to increase with age. Belgium can be a depressing place, for sure. One look at my payslip followed by yet another massive top up bill was depressing enough on it's own. I would be very surprised if a lack of mental health care is to blame.